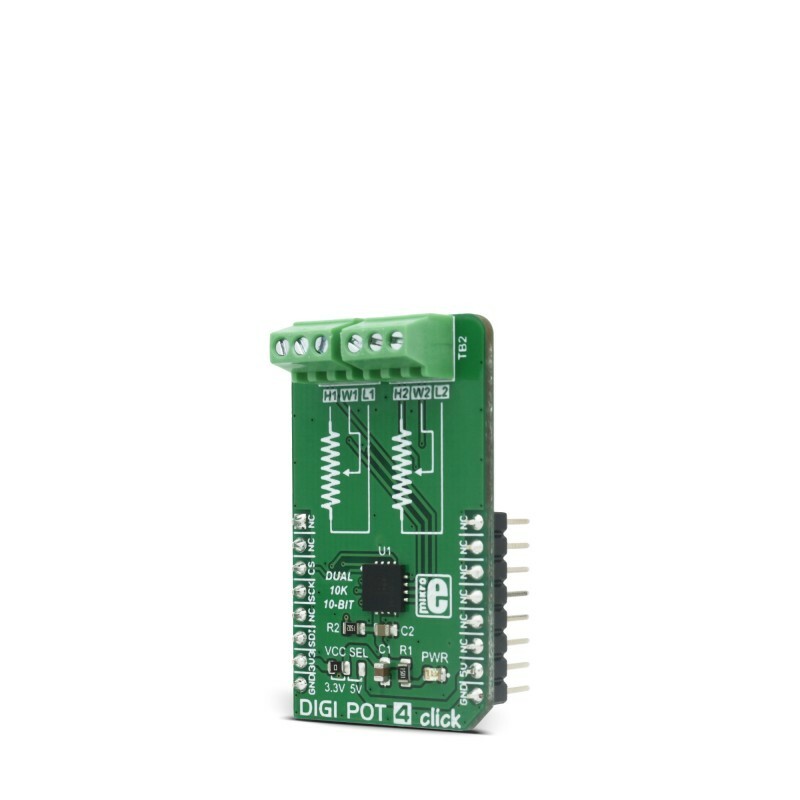 DIGI POT 4 click is a digitally controlled dual potentiometer, with the resistance of 10KΩ. It has a 10bit resolution which allows for a very smooth linear wiper positioning through 1024 steps. Digital wiper position can be controlled via SPI interface. 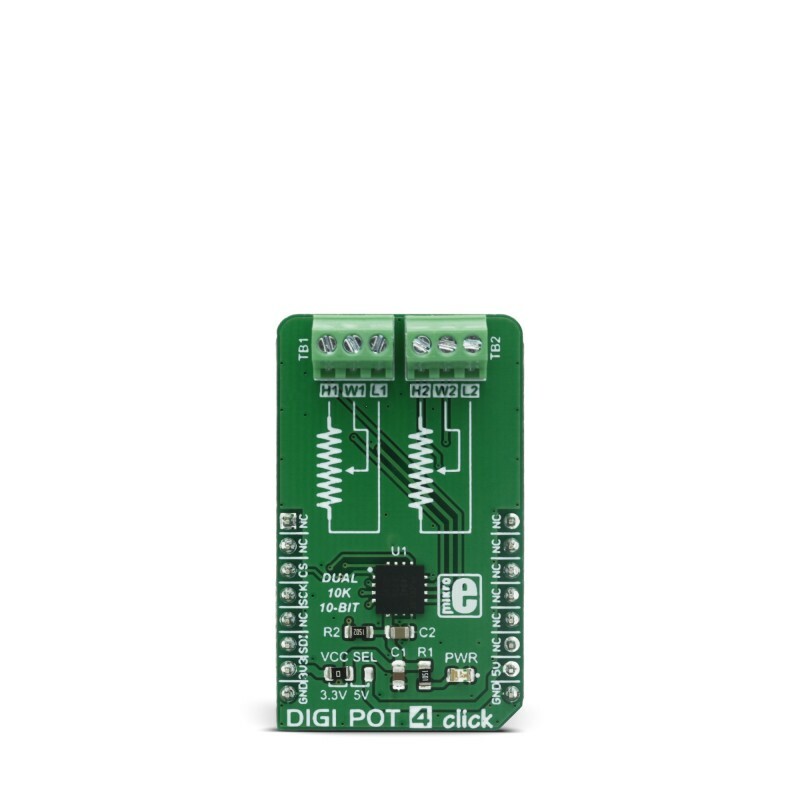 DIGI POT 4 click also features a non-volatile durable EEPROM memory for storing the wiper position, which means that the device can restore its last position after the power on - just like its mechanical counterpart. The main advantage of the digital potentiometers over the mechanical ones is that they can never wear out. The wiper position can be precisely programmed, and the wiper contact with the resistive coating can never be compromised by the influence of the dirt or moisture. Due to its low THD and good bandwidth, it can be used for digital volume control or a precise gain and offset adjustment. It can also be used as the LCD digital contrast control, and generally - whenever a precise dual digital potentiometer is required. 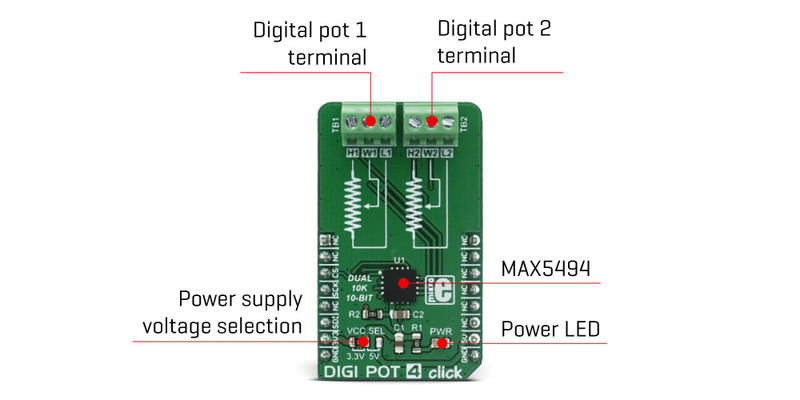 DIGI POT 4 click carries MAX5494, a 10bit dual, non-volatile, linear taper, digital potentiometer, from Maxim Integrated. This IC consists of the control logic and a resistors stream (i.e. 1024 equal resistors serially connected) through which the wiper is moving. The end-to-end resistance of the resistors on the used IC is 10KΩ. The wiper movement is done by writing 10bit data into the wiper registers, resulting in 1024 discrete positions the wiper can take. All three terminals of the digital pot are routed to the IC terminals and further to the onboard connectors, for easy and secure connecting to the rest of the circuit. 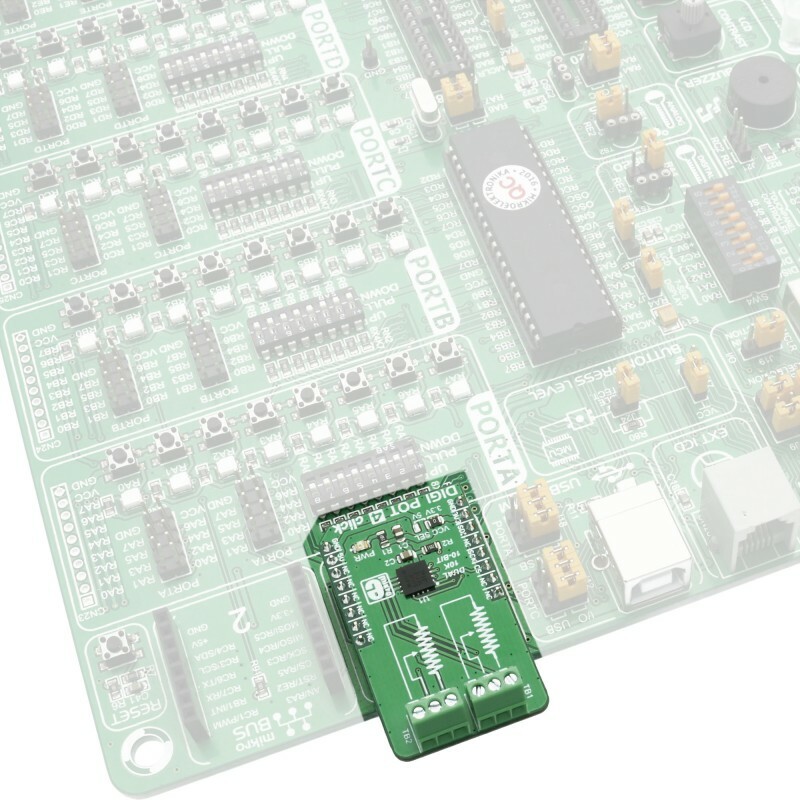 The MAX5494 contains two such potentiometers, routed to the click board™ screw terminals. Depending on the output impedance to which the wiper is connected, it is possible that the voltage drop may occur while switching positions, therefore it is not recommended to use it as the variable resistor. After the power on, the content of the EEPROM NV memory will be copied to the volatile RAM, used as the shift register for the wiper position. This volatile memory register directly controls the wiper position. The wiper can be positioned by writing data into this register. The EEPROM NV registers are only written if requested, by using the specific write command. This way, the EEPROM lifecycle is prolonged, although it can withstand up to 200000 read/write cycles. 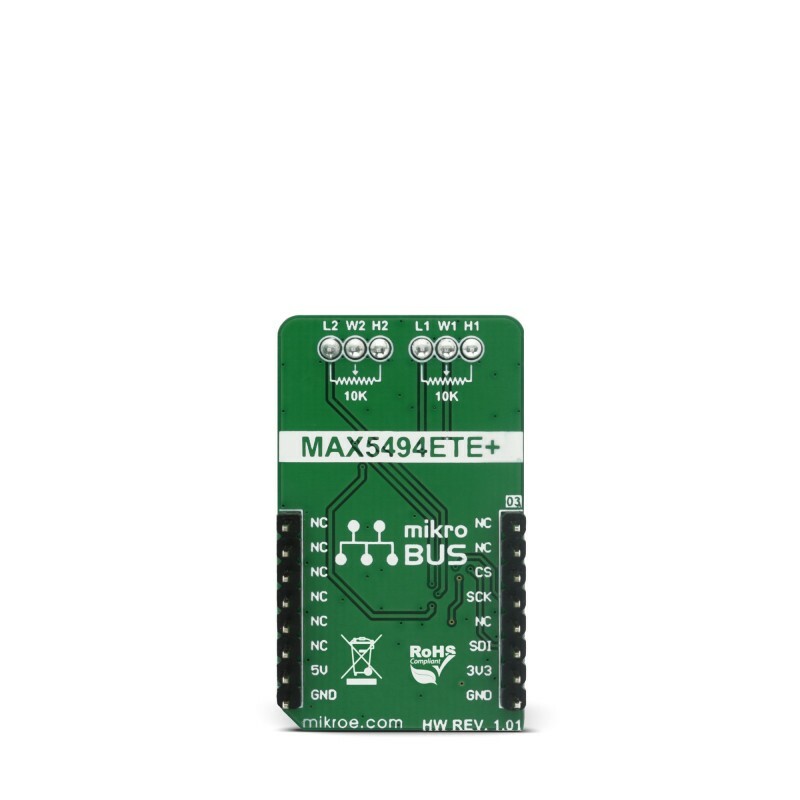 All the communication with the control logic of the MAX5494 is done through the SPI, so all the SPI signals are routed to the appropriate mikroBUS™ pins. The CS pin is held high, preventing the SPI communication, so as always - to initialize the SPI communication, the CS pin needs to be pulled LOW by the MCU. Besides two connectors used to connect the potentiometer terminals, the click board™ is equipped with the SMD jumper, used to choose between the 3.3V or 5V operating voltage. This table shows how the pinout on DIGI POT 4 click corresponds to the pinout on the mikroBUS™ socket (the latter shown in the two middle columns). We provide a library for DIGI POT 4 click on our LibStock page, as well as a demo application (example), developed using MikroElektronika compilers and mikroSDK. The provided click library is mikroSDK standard compliant. The demo application can run on all the main MikroElektronika development boards. The library carries two functions which are sufficient to have complete control over DIGI POT 4 click. Application Task - (code snippet) - Sequentially sets the wiper position every second.